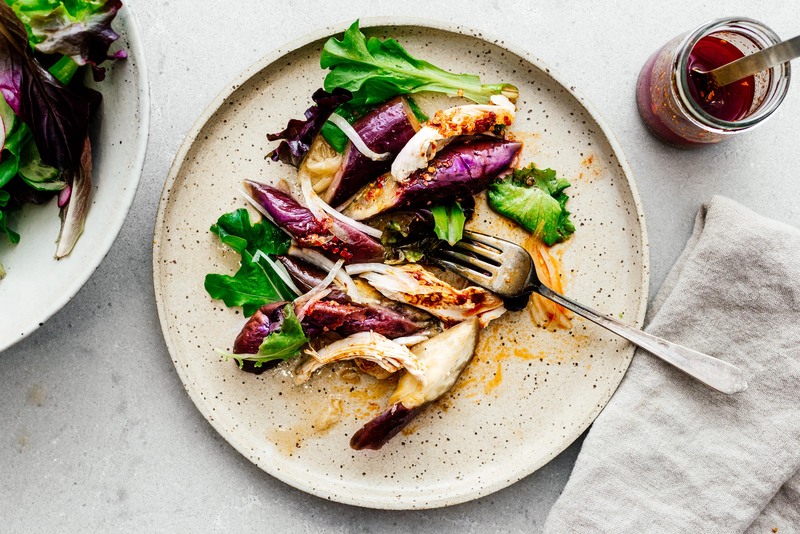 You’re only an hour away from keeping it health-forward with this easy roasted chicken with eggplants and tomatoes. Like everyone else on the planet, I’ve been trying to eat healthier this month. Well, wait, that’s kind of a lie. I’ve only really started trying to eat healthier since I made this chicken two days ago. See, I have really, really poor eating habits. I LOVE carbs and processed food and basically all the stuff that’s bad for you. But, I love healthy foods too, it’s just that I sometimes forget it. And when there’s nothing in the fridge that’s healthy, it’s so easy to turn to a bag of chips or pasta or bread, or anything carb-heavy. But chips are not really my friends, so I’m gonna take a little break from that toxic relationship (at least until I can figure out how to make healthier chips at home) and focus on eating fresh, carb-light, veg-heavy foods. 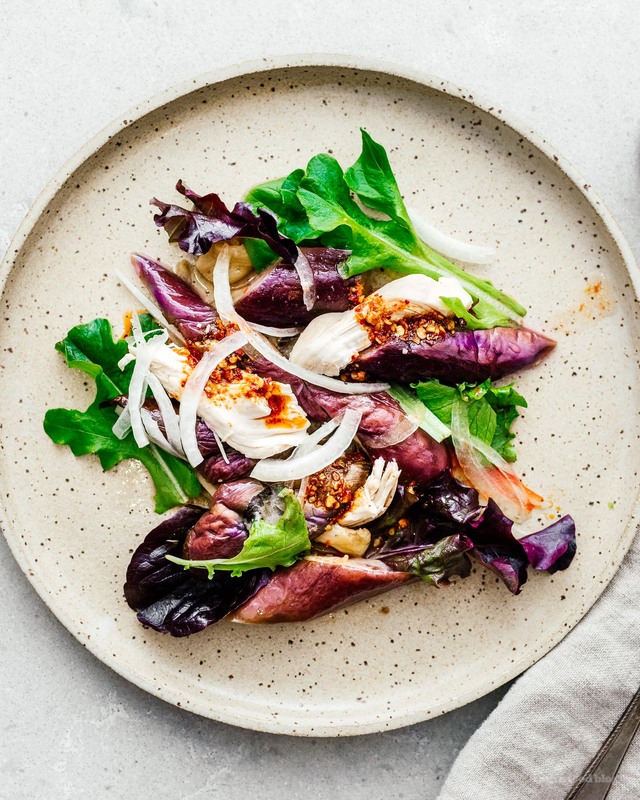 Enter this easy roast chicken with eggplant and tomatoes. You might be thinking: chicken?! That’s not veg-heavy. Ah, but it is carb-light, and with the addition of eggplants and tomatoes, you can switch up your plate from chicken with a side of vegetables to vegetables with a small bit of chicken. The real star of this show is the eggplant. It gets all soft and delicious when cooked in chicken juices. I almost wish I made 2 times more eggplant than I did. That’s not to say that the chicken is nothing to sneeze at! Mike roasts a lot of chickens and we’ve pretty much settled on roasting chickens breast side down, especially when the chicken is just for the two of us and we’re not concerned about aesthetics. Roasting breast side down means that all the fat and juiciness from the thighs and back settle on down into the breast. 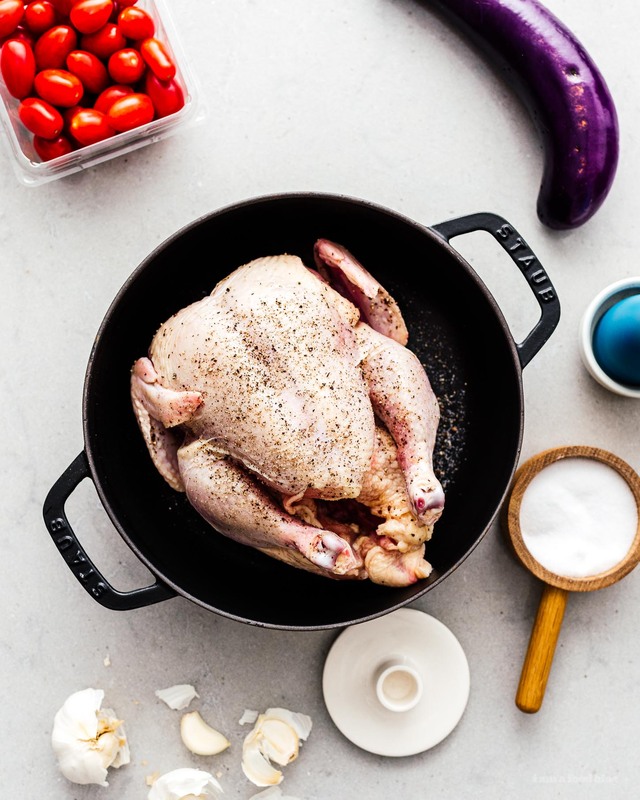 Plus, the thighs, which take the longest time to cook, are exposed to the heat and cook more evenly while the breast is protected from overcooking by the rest of the chicken. 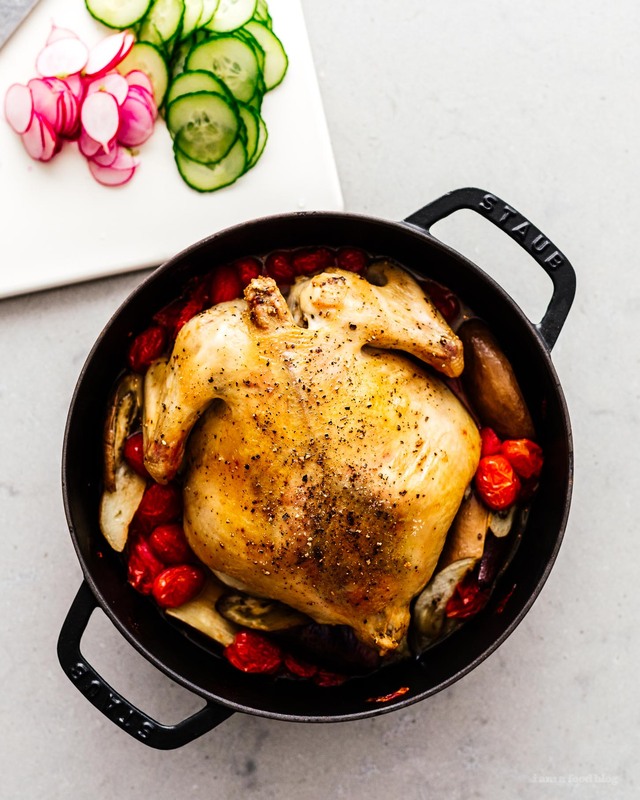 It means that you don’t have that classic looking roast chicken, but you have perfectly cooked juicy crispy thighs and tender properly cooked breast meat. And roasting a chicken basically means you’re going to be eating great for the rest of the week. Chicken with salad, chicken in soup, chicken with zoodles, chicken salad rolls, and the list goes on…especially if you’re not trying to be healthy cause then you’ve got butter chicken (just stir it into the sauce), chicken pizza, and chicken chow mein. Or, you could do what I do and just eat it, as is. This chicken was seriously good. 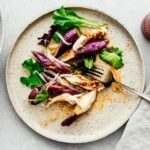 I mostly had the eggplants – which were tender and filling – with a bit of chicken, thinly sliced white onions, salad mix, roasting juices, and Chinese chili oil. Seriously so good! Note: I roasted this breast side down because the breast says really tender and juicy that way. But, you won’t get crispy skin on the breast, so if you’re a fan of crispy breast skin, roast it the other way. Season the chicken generously with salt and pepper on all sides and inside the cavity. Place in a large oven safe roasting tray or dutch oven, breast side down. Toss the garlic with the oil and nestle in amongst the bottom of the chicken. Place the chicken in the oven and roast for 30 minutes. While the chicken is roasting, prep the eggplant. Cut down lengthwise and then slice on a diagonal every 2-3 inches. When the chicken has roasted for 30 minutes, take it out of the oven and add the eggplant and tomatoes. Roast for another 30 minutes or until the thickest part of the chicken thigh reads 155ºF/160ºF (the chicken will cook another 10 degrees while resting, use the higher temperature if you don’t want to see any pink in the chicken). Rest your chicken uncovered for 5-10 minutes, then enjoy! Hey guys! Wondering if I can place the chicken in the dutch oven with no rack. Also, the garlic/oil doesn’t need to be rubbed over the chicken? This recipe looks so yum and I love your food pics. I will for sure try this dish! thanks so much, hope you get a chance to try it! I made this last night and it was amazing!! I used 6 baby eggplants which was a lot, but I have no regrets. Next time I think I will do 2 heads of garlic!